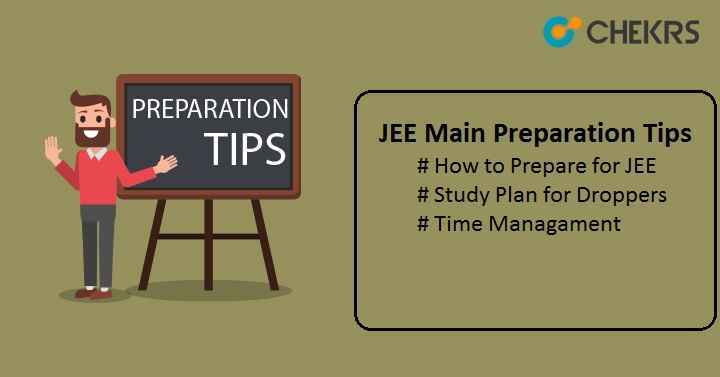 JEE Mains Preparation Tips 2019: JEE Main is a national-level entrance exam conducted by National Testing Agency (NTA) to offers admission into various government & private engineering colleges or institutions across the country. From the upcoming year, this exam will be held twice in a year. Approximately 12 lakh students appeared for JEE Main 2019 Entrance Exam every year but only few students got selected for IITs, NITs, CFITs, and other government colleges. To crack this exam and to get college of your choice, students will have to follow the JEE Main Preparation Tips. Here we have discussed some tips and tricks to score maximum marks in JEE Main 2019. Candidates must follow the correct and complete Syllabus of JEE Main. First complete the syllabus of class 11 and then focused on class 12 syllabus. Be sure to complete the Class 11 course by the end of July and then start with the class 12 syllabus. After completing the whole JEE Main Syllabus, must practice the previous year papers to improve your speed and accuracy. Solving more & more sample paper will help you in time management and also tell how much you are prepared for the exam. JEE Main Previous Year Question Paper will guide you about the exam pattern, marking schemas etc. Revision is the key to success. Students must revise at least 2 chapters per day from all the three subjects. It is important to understand the basic concepts. Revise formulas, chemical reactions regularly. At least 3 hours is must for revision. Sometimes many students get irritated and lose their confidence. Candidates get depressed and frustrated while thinking about this What if they can’t crack the JEE Main 2019 exam? What if they will not get IITs, NITs, or any good college of their choice? So don’t lose your patience, keep calm and always think positive. Don’t think about failure, just do hard work and keep in touch with your faculty for guidance. Students should make a time table and follow it strictly. Give proper time on each subject and topic. Like if you are weak in any subject or topic, give time on weaker part. Don’t give much time on the topic you like. Separate the time for solving sums, solving JEE Main Previous Year Paper, for revision, and so on. Eat proper and nutritious diet. Don’t eat junk or outside foods. Drink lots of water. Take at least 6 to 8 hours of sleep. Do yoga and meditation to improve your concentration power, to keep your mind calm and patience. Do not ignore your health while preparing for your study at any cost. Students must go through NCERT or course book to know the basic concepts. Take the help from JEE Main Best Books. Selecting right books for JEE Main will help you to crack the exam easily with the maximum marks. Candidates should make notes of important topics, chemical reaction and formulas also. Revise the notes or key points on regular basis. Dropper students should learn from the mistakes made earlier. This will guide you to crack the exam in better way. Don’t repeat the mistakes you made in the last exam. Always take right decision toward your career. Tags:JEE Main 2019, JEE Main Application Form, jee main preparation tips, JEE Mains Syllabus, jeemain.nic.in.